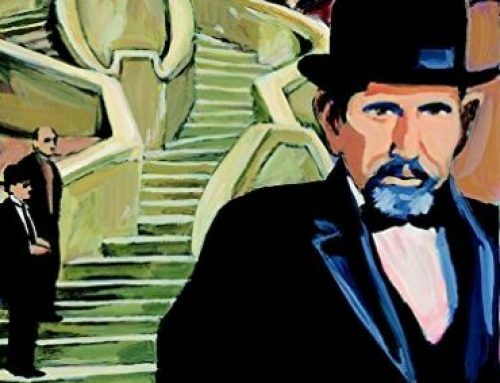 The task of cataloguing and translating Albert Levy’s prolific Ladino output was especially meaningful because Levy, a prominent Sephardic journalist and community leader born in Salonica, was Ashley Bobman’s own maternal great-grandfather. A profile in our Fall 2013 Newsletter (viewable at this link) detailed the chance meeting at a Hillel Shabbat dinner in Fall 2012, wherein Naar realized that the student at his table was related to Albert Levy, whose notebooks had just been rediscovered in a storage closet at Congregation Sephardic Bikur Holim in Seattle. Over the next several semesters, Prof. Naar, who is also an Assistant Professor in History and the Jackson School studying the transnational migrations of modern Jews, worked with Bobman on the finer details of Ladino, while also helping to contextualize Levy’s work in the historical landscape. 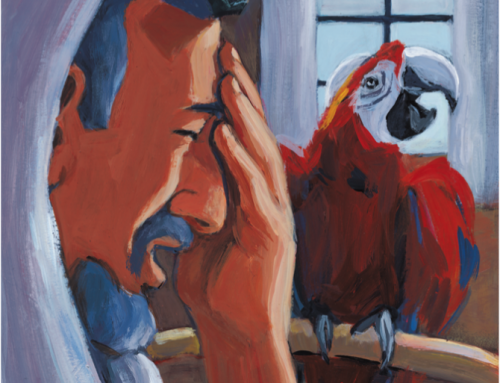 The exhibit contains fourteen distinct sections, with each page exploring a different aspect of Levy’s career. Scanned digital documents from the Sephardic Studies Collection at UW Libraries accompany Bobman’s narrative, bringing Levy’s words to life. Several Stroum Center staff members collaborated on realizing the vision for this first Digital Museum exhibit. Prof. Naar worked with Ty Alhadeff, the Sephardic Studies Research Coordinator, to locate the best archival items for each section. The Stroum Center’s media team, Hannah Pressman and Kara Schoonmaker, consulted with Naar and Bobman on ways to organize the material in a visually exciting way. Schoonmaker then designed and built the page over the Spring 2016 quarter. Last month Bobman presented her research on Levy to the Jewish Genealogical Society of Washington State. Her talk included the beta model of the “Sephardic Lighthouse” exhibit. “Online archives are the way to bring everyone together, no matter where they are,” she said. 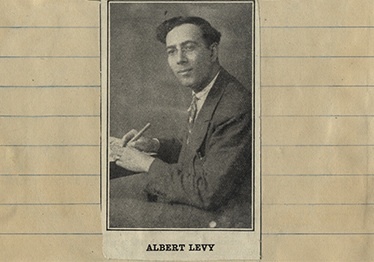 Sephardic educator and writer Albert D. Levy, in a photo from one of his scrapbooks. Photo courtesy of the UW Sephardic Studies Collection. Learning Ladino (also known as Judeo-Spanish or Judezmo) was a challenge at first. Bobman had a background in high school Spanish and the Hebrew alphabet, but had to work hard to learn Rashi script in order to read Ladino. Her persistence paid off, however: she has successfully translated several of Levy’s works, such as this poem about Sultan Bayezid II and the Spanish exile. Even more impressively, Bobman is now one of the very few people in the country who is able to write original poetry in her ancestors’ language, both in Latin letters and in meruba (block type). 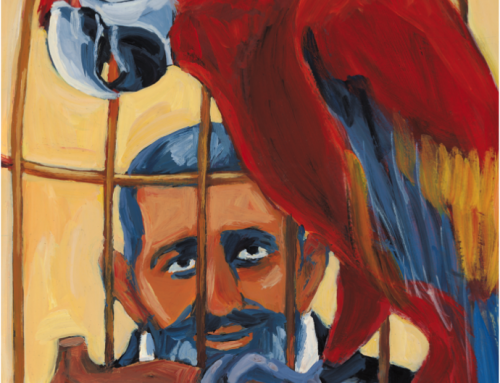 One of these original Ladino compositions, “Muestra Kultura (Our Culture),” has been published on our website as a companion piece to the “Sephardic Lighthouse” exhibit. For her academic rigor and service to the community, last year Bobman received the prestigious President’s Medal for outstanding sophomore student at UW. She will attend Yale University this fall to pursue a Masters of Science in nursing. However, via cross-country coordination with Prof. Naar, she hopes to continue both her original Ladino poetry writing as well as her work translating her great-grandfather’s copious output. 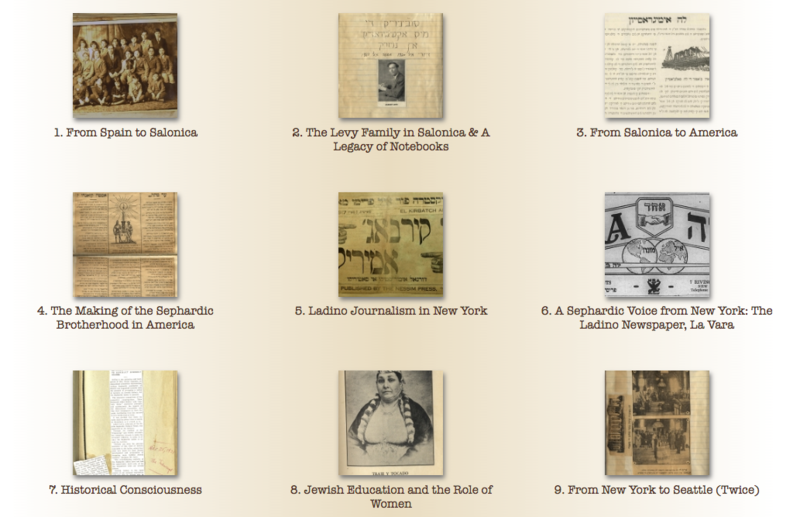 Screenshot from “Sephardic Lighthouse” exhibit homepage, via the Stroum Center website. 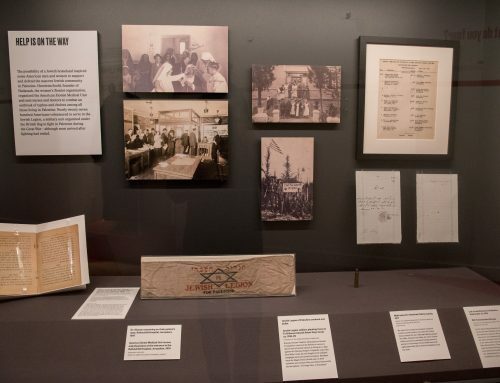 The structure of the “Sephardic Lighthouse” exhibit allows for dipping in and out of the various sections. 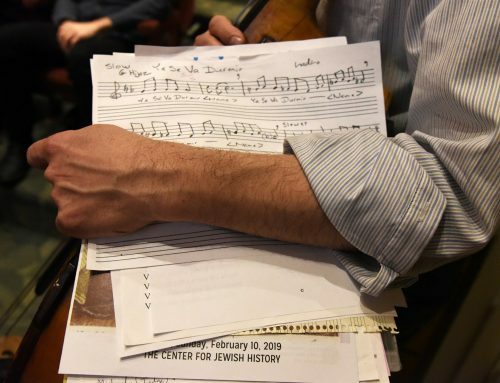 A particularly poignant memento highlighted in Section 13, “A Notebook of Inspiration,” was lent to the Sephardic Studies Program by Bobman’s aunt, Linda Robke. The small notebook contains quotes that Levy gathered throughout his life, perhaps to include in his public lectures. Bobman observes that while “the first half is penned in Ladino, in soletreo (the handwritten Sephardic style of the Hebrew alphabet), the second portion of the notebook is in English, the language Levy increasingly adopted in the United States” after arriving from Salonica in 1916. From Plato to Confucius, Ben Franklin, and George Bernard Shaw, the pocket-sized notebook makes clear that Levy drew inspiration from a melting pot of non-Jewish sources as he made his way in his new country. Many of the quotes are optimistic and reflect the importance of faith, as in this well-known quote by the theologian Reinhold Niebuhr: “God grant me the serenity to accept the things I cannot change; the courage to change the things I can; and the wisdom to know the difference.” For a transplanted Sephardic cultural activist, first in New York and later in Seattle, this cri de coeur may have had particular resonance, as Albert Levy helped his community maintain its unique traditions while also integrating into the new fabric of twentieth-century America. Thanks to Ashley Bobman’s pioneering work, Levy’s Sephardic Jewish journey will now be accessible to anyone around the world who is interested in meeting this remarkable historical figure. Mazal alto, indeed! 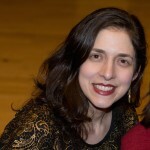 Dr. Hannah Pressman writes about modern Jewish culture, religion, and identity. A lifelong lover of languages and literatures, she earned her Ph.D. in modern Hebrew literature from New York University. She is co-editor of Choosing Yiddish: New Frontiers of Language and Culture (2012). Her writing has appeared in Tablet, the Forward, Lilith, eSefarad, and My Jewish Learning. Dr. Pressman is the former Communications Director and Graduate Fellowship Coordinator at the Stroum Center for Jewish Studies. She is currently at work on a memoir about her Sephardic family history, connected to explorations of contemporary American Jewish identity. 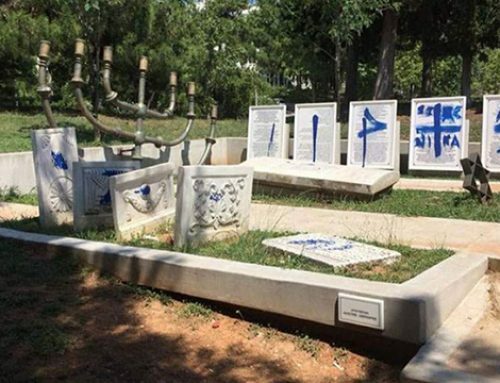 Are Sephardic folktales still Sephardic?